Taking off: BentSpoke owners Richard Watkins and Tracy Margrain. 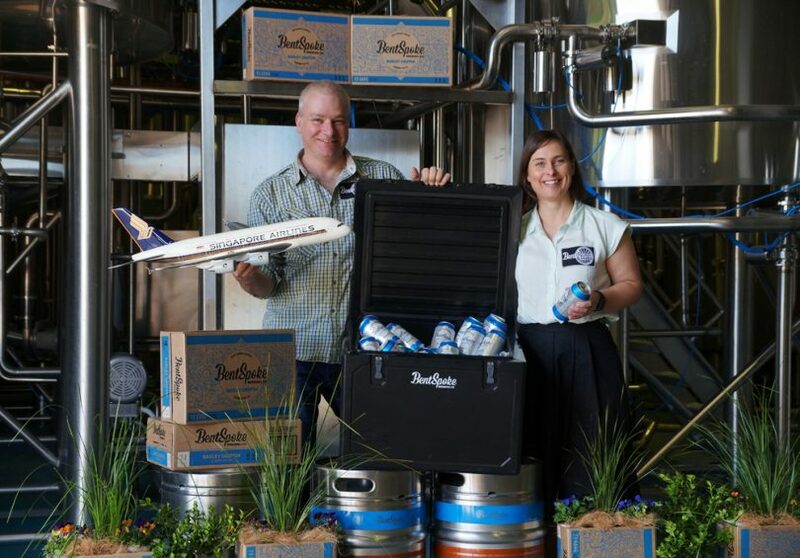 Local craft brewer BentSpoke Brewing Co is flying high after its ‘Barley Griffin Pale Ale’ was chosen to slake the thirst of Singapore Airlines’ Business and First Class passengers on flights out of Sydney and Melbourne. From 1 October the airline will stock craft beer on all of its flights in and out of Australia. BentSpoke co-owner and head brewer Richard Watkins said it was humbling to be chosen by such a prestige carrier as Singapore, which the company had been talking to ever since their decision to fly into Canberra. But another brewer already had the Canberra run, so Singapore offered them Sydney and Melbourne for a year. “It’s a huge honour for us to be chosen from all the great breweries in south-eastern Australia,” Mr Watkins said. He said Barley Griffin, which won a gold medal at the 2017 International Brewing Awards, suited Singapore’s needs for a flavoursome low-alcohol beer. “It was all about trying to get something that was reasonably easy drinking, with a bit of flavour,” he said. Mr Watkins said BentSpoke was already looking at export opportunities in Singapore and China but this deal would reinforce those plans. “One of our regular patrons from Braddon moved to Singapore and was missing our beer so much he went around and got four or five bars on board to stock our beer,” he said. BentSpoke’s new, bigger facility at Mitchell is integral to this and has also allowed it to give customers the best price it can. “I’m dismayed by the price of a lot of beer in the market. More competitive pricing allows people to try different beers they don’t have to pay an arm and a leg for,” Mr Watkins said. BentSpoke has just launched two new packaged beers this week – the GFG (4% alcohol); a gluten friendly ginger beer that uses an enzyme to break down the gluten, and the Sprocket (7% alcohol); big and hoppy with tropical fruit flavours. Singapore Airlines Regional Vice President; Mr Tan Tiow Kor, said the introduction of craft beer on board reinforced Singapore Airline’s commitment to supporting local Australian producers and businesses, as well as Singapore Airline’s focus on delivering a premium food and beverage offering. “Since we began operating in Australia 50 years ago, we have consistently looked to source local Australian produce when we have had the opportunity,” Mr Tan said. Not on the Canberra flights?